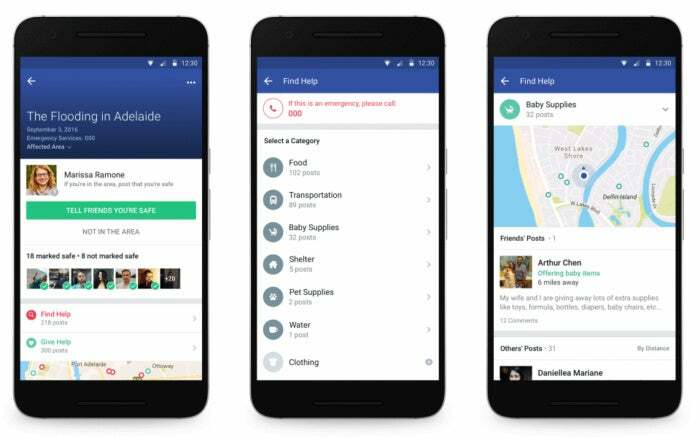 Facebook is taking its Safety Check feature beyond the ability to just mark yourself and others as safe with a new addition called Community Help, which started rolling out Wednesday. Facebook first announced Community Help in November at the company’s Social Good Forum.s during a crisis. This can be food, a place to sleep, baby supplies, and other essential goods or services. When Community Help is active users in the affected area will see a “Find Help” link on the Safety Check page for their particular crisis. Underneath that will also be a “Give Help” option for those who want to assist their neighbors. Community Help will initially be available to users in the United States, Canada, Australia, New Zealand, India, and Saudi Arabia. Community Help was inspired in part by Facebook users who were already banding together to offer each other help in times of need. The company says it also consulted experts and humanitarian relief organizations to develop the new feature.